James Bogardus was an American inventor and architect, the pioneer of American cast-iron architecture, for which he took out a patent in 1850. In the next two decades he demonstrated the use of cast-iron in the construction of building facades, especially in New York City, where he was based, but also in Washington, DC, where three cast-iron structures erected by Bogardus in 1851 were the first such constructions in the capital. The success of the cast-iron exteriors from 1850-1880 led to the adoption of steel-frame construction for entire buildings. Born in Catskill, New York, Bogardus quit school at the age of fourteen to start an apprenticeship at a watchmaker. Bogardus attached plaques to his cast-ironwork that read: "James Bogardus Originator & Patentee of Iron Buildings Pat' May 7, 1850." He married Margaret McClay.He was a descendant of the Rev. Everardus Bogardus (d.1647), the second clergyman in the New Netherlands. 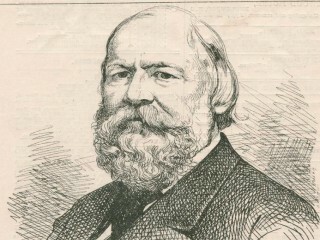 Bogardus died in New York City aged 74. -The eccentric mill (1832), still used in principle for fine finish of ball bearings, and, with variable eccentricity, for lens grinding.